Postponed until the autumn due to unforeseen circumstances. 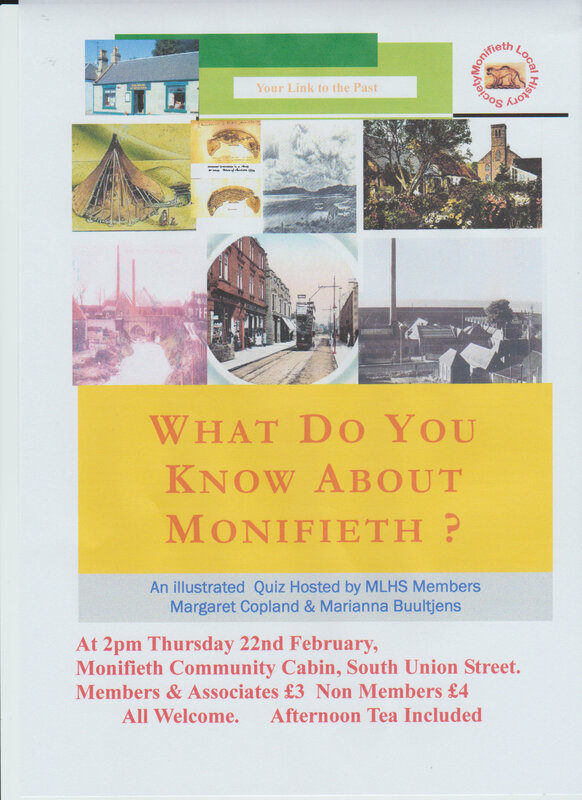 What do you know about Monifieth? Seems a long time since our meeting in December and the closure of `55` over the festive season. Our plans for the future are still `in the making, or so to say. On behalf of the group, I with others have been involved in various discussions with representatives of Angus Council, regarding the lease of the currently vacant former Angus Access Office. Following months of discussion and negotiations, we are still `at the table`. However, we have over the months been encouraged by the volume of support for the House of Memories survival, from members of the community and further afield. It is gratifying to learn that the services we provide are appreciated locally, nationally and internationally. Volunteering and working for your community requires time and commitment and those of Monifieth Local History Society have given both, ensuring that the Heritage of the town and surrounding area is preserved for the future. The generosity of those who have gifted or loaned items for display, has brought about the need for larger display accommodation, with space for research facilities. We also need involvement by volunteers to ease the workload of `manning the desk` at the House of Memories, to keep it open on a daily basis free of charge to the public. The many letters of support make reference to “the great services provided” and the popularity of `Monifieth`s special place`.